A DRONE STRIKE in south Yemen killed at least 30 suspected Al-Qaeda militants today, the latest in an intensified aerial campaign in the impoverished country, a tribal chief said. An earlier toll said five militants had died in the attack which also wounded many others when it targeted a gathering of militants in the town of Al-Mahfad in Abyan province. “More than 30 members of Al-Qaeda were killed and many others wounded,” said the tribal chief. The unmanned plane targeted a gathering of militants in the town of Al-Mahfad, in Abyan province, where Al-Qaeda remains active despite being driven out from main cities in a 2012 army offensive, the source said. A statement on the 26sep.net defence ministry website said the attack on Al-Qaeda “training camps” killed “several” militants of various nationalities. 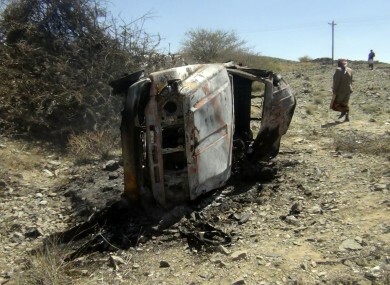 The United States is the only country that operates drones in Yemen, but officials rarely discuss the covert programme. The strike comes a day after a similar attack in the central province of Baida killed 10 Al-Qaeda suspects and three civilians, according to a newly revised official toll. An earlier toll of Saturday’s strike had put the number of militants killed at 15. The drone programme has come under criticism from human rights activists concerned over civilian casualties. The United States has defended the drone campaign, which allows it to target Al-Qaeda without the use of ground forces in lawless areas where authorities cannot or will not act against the group. Yemen is the ancestral home of Osama bin Laden and the home base of Al-Qaeda in the Arabian Peninsula, or AQAP, which has been linked to a number of failed attacks on American soil. The group has taken advantage of the weakening of Yemen’s central government since 2011, when a popular uprising erupted that eventually forced president Ali Abdullah Saleh to step down after 33 years in power. Email “43 dead in two days of drone attacks in Yemen”. Feedback on “43 dead in two days of drone attacks in Yemen”.